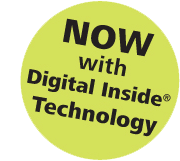 viewing of both digital and print materials with up to 40% wider fields of view. and they make our eyes work harder than ever before. Pure vision for the digital world. Digital devices like mobile phones and tablets have changed the way we live, work and play. But they’re also challenging our vision like never before. We hold digital screens at a higher angle and closer to our eyes than books and newspapers. Eye movements are faster and more dynamic, rapidly refocusing between near vision and far. Today presbyopes need a progressive lens that gives them outstanding vision in the real world and the digital world. ZEISS Progressive Precision Pure meets both needs with ZEISS Digital Inside technology and full Rx customization - supported by ZEISS Precision Technology for enhanced clarity, faster refocusing and optimal lens aesthetics. • The way the frame fits you. The result is a lens precisely designed and adapted to your unique face, providing maximum 3D vision and up to 50% wider fields of view. Traditional eyeglass lenses were not designed for this major shift in our visual needs. The frequent result is Digital Eye Strain, with symptoms including headaches, blurred vision and tired eyes. The near vision zone and inset are adjusted for the reading distance required for printed materials like books and papers. The near vision zone is not compatible with the shorter, higher reading distance needed for digital devices, resulting in an unnatural head and body posture as wearers attempt to view digital devices through the near vision zone. With a wider, deeper near zone, you can comfortably read both conventional and digital materials without physical or visual strain.